Throughout 2014 Marbocote have continued to sponsor the University of Liverpool Motorsport by providing cleaner, sealer and release agents to enable the manufacture of high quality carbon fibre parts for their latest car which will be racing in Formula Student 2014. Marbocote have generously donated a selection of composite mould preparation products, which will allow for the manufacture of ULM009’s carbon fibre parts. The porous epoxy moulds used must be thoroughly cleaned and prepared using specialised cleaner, sealant and release agents, to ensure a high quality part finish is achieved. Without these supplies provided by Marbocote, this arduous task would also be an expensive one, potentially also yielding much lower quality parts. The team look forward to working along with Marbocote in the future, as high-tech composite materials continue to be an increasingly important part of the car’s design. 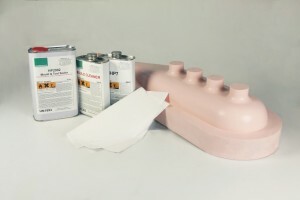 The image below has been taken by ULM and it shows the products that have been provided by Marbocote and one of the epoxy moulds that has been used in their manufacture.